In the description we start with - if there are- the search for specific characteristics that distinguish the dance from other similar dances. We then provide some well-known examples, so music, rhythm and atmosphere are clearer. If available, we set the pace which is usually danced in beats per minute. Personal preferences may be different. Some people prefer a fast pace until smooth. And probably we all started on a (too) slow rhythm. And we look for the origin of the name of the dance. For the origin of some names (e.g. salsa, Lindy hop...), there are several different and amusing stories. We pick the best documented out there, and possibly also mention the best anecdotes. Often the source is buried in a vague and distant past, and hard or not to be found. Or based on assumptions. The names of some types of dance cause confusion. There may be continental and regional differences. Swing is for example often used for Jive in the U.S. while some dance schools give that name here the disco or swingfox. We try to give the greatest common divisor of the Dutch-speaking region again. Then follows a sketch of the history of that music and dance, which usually evolve together. The origins of many especially Latin dancing is a soup. Vague and unclear. There is no clear pedigree of dancing. If a writer claims that dance A was at the basis of dance B, you 'll find a writer who just says the opposite. We'll just keep in mind that most latino dances have influenced each other. 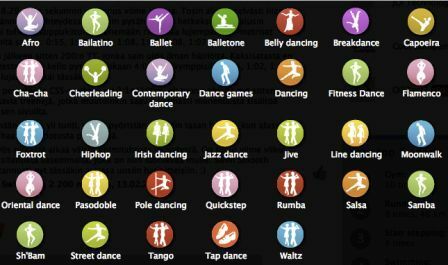 The website also has a video example showing each dance. That says a lot more than text.